When I was a student the first thing our music teacher asked us to do for Y10 GCSE Music was Grade V Theory. This was for many reasons but the main one is you cannot progress past Grade 6 on an instrument with the ABRSM unless you have passed your Grade 5 Theory and it was a good excuse to get everyone up to a basic theoretical standard. It was pretty dull to be honest and very much an academic exercise. The musical outcomes appeared to be next to non existent. We grumbled about it as a class and couldn’t see the point apart from to satisfy the crazy requirements of the ABRSM. But reflecting years later it was probably the most important thing we did. The course was easy as a result. We all got A’s and B’s and half of us went on to study Music for A-Level. In another change I binned the tuba because I could not find any decent videos of a solitary tuba. Yep not even “Tubby the Tuba”. So I have gone with the djembe as the Year 1’s are also studying Africa and it fitted in nicely. Organise all the music 3-6 months in advance. Think in terms of the audience – if Johnny’s parent is sitting here what is she going to see/hear Johnny do? My last post was a bit negative about teaching composition in schools so this is going to be a bit more constructive. Like I said, composition is a higher level skill and mucking about with instruments without having to think carefully and make choices simply is not composition. Yes, composition can be completed in groups but when starting out, group compositions are actually more difficult to administer than individual ones simply due to group dynamics and the necessity to make choices that everyone can agree with. It is easier to agree to your own choice than other peoples. The key to good composition is listening, aural skills, the ability to know what you are going to do before you play it and more than anything the ability to limit your choices and understand how to develop a compositional feature. This all must take place with knowledge of who is playing your music and where it is to be played. Computers can take away some of these constraints but actually that is one of the reasons why students flounder when it comes to composing using computers – there are too many possibilities and it is not a lack of material that young people suffer from when composing. It is too much – they do not know how to develop their material. There is an idea and an instruction. But the music is not developed. LaMonte Young would probably disagree and say “a long time” is the development. There is a title and a signature and it is dated so that we can identify who played what at what time. Interestingly there is no indication what instrument is specified to play it, or whether it should be sung. Obviously it needs to be said that only instruments or voices that are capable of producing the sound can qualify for this to be played. I would ask students to make their own tiny composition as an initial task for 5 minutes. It can only last one bar. It has to have a musical idea, a title, a date and a signature. It has to be played by the person next to you. It does not have to use a musical stave but you might as well get used to using one as it will make the course a lot easier for you. You can’t copy anybody else’s work living or dead that you know about. The reason for this task is two-fold. Firstly, I would want all composition work returned to me to follow those basic non-negotiables right from the very start. Secondly, there are many students who think they cannot compose – there is a stigma and this is a simple task that anyone who has some sort of interest in music will be able to complete. Also, within these simple constraints you will see quite a lot of creativity going on. My next step would be to take the musical idea that they have thought of and change it in some way. Only a small way. Repetition is certainly allowed but there has to be some sort of development of the material. Again this has to be signed and dated just as every piece will have to be. Finally I would say that the next step is to think of some sort of ending. A musical idea stated, developed and ended is a microcosm of any piece of music. That is the basic premise of composition. I would then probably finish off by playing Beethoven’s Fifth and show how he takes a very simple idea we all know “da da da daaaaa” and develops it. Homework – a piece of music signed and dated which presents an idea, develops it and ends it. Any length is OK but if anyone hands in nothing I am sorry that is unoriginal as it has already been handed in by John Cage a while ago. Is the following an act of composition? Putting up an IKEA wardrobe? Playing a series of notes written down by some else on an instrument? There is certainly a difference between following instructions and creating something. But is all creation composition? And can a composition be uncreative? In music, composition is normally termed to be “making up music” but would a child who just repeatedly hits a drum be composing? Is an elephant composing when it hits his trunk on a piano or a cat walks all over the keys? If I gave a child a piece of paper saying “hit the cowbell ten times” that would be termed as a performance as they are following instructions. However, if a child said “I am going to play the cowbell ten times” and then plays it, that would be an act of composition. If I said to a child “you need to make a composition on the cowbell. Decide how many times you are going to play it and then play it”, this too would be an act of composition as it requires thought and the requirement to make a choice or choices. This suggests that composition can only be composition if there is prior thought put into the activity by the individual(s) and there is an element of choice. But then would improvisation be composition? Improvisation is making up music as you go along, so isn’t this just performance? However, a good improviser is someone who creates music on the spot but who has put a lot of prior thought into it beforehand, often over many years. As any good jazz improviser will tell you, you need to know your scales in every key to improvise well. From this line of thinking, it seems that composition is “music that is made up with prior thought where choices need to be made”. It therefore stands to reason that people with more knowledge of music should be better at composition as they know more and people with more experience of playing an instrument should also be better. However, this is not the case as there are many elite musicologists and performers who say, often with sadness, that they are “useless at composition” or simply “can’t compose”. This is probably because what they think of as composition is a lot more complicated. Given eight bars starting on C and ending on C they could probably make up something in the middle but they are also equating the activity of composition within the constraints of harmony – usually Western tonal harmony. So when does composition require knowledge of harmony? Does it need to? And why if it doesn’t do so many musicians think that it should? If knowledge of tonal harmony is considered important in the act of composition, is a note row a composition? 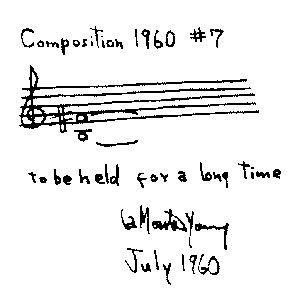 A note row is a technique often attributed to Arnold Schoenberg in the early twentieth century where each tone has equal importance negating the whole need for tonal harmony. This basically is the equivalent of painting by numbers if you substitute colour for pitch. Some knowledge of rhythm of course is important unless your note row is simply a series of different notes of uniform or undefined duration. Also, a mathematician could probably create an excellent tone row – is it a musical composition if anyone could do it? If a computer generates it, is it a composition? Boulez composed his “Structure 1a” as a serialized piece, mathematically serializing each musical element. This could be programmed as a mathematical algorithm. We could even program in randomization into the algorithm. Does this mean you don’t have to be human or even alive to be a composer? Also, what is the difference between composition and plagiarism? Did Mahler compose his 1st Symphony or did he just take “Frere Jacques”, turn it into a minor key and orchestrate it? If you took any existing major tune and flatten the 3rd would this be a new composition? Where is the gap between creation and plagiarism? This goes way back to the beginning of what we know from music history – some of the first written-down compositions that we can find plagiarized or incorporated a cantus firmus melody originally chanted by monks. It is for these reasons that we can make sense of the changes in attainment targets for the National Curriculum for Music in England and Wales. To start with there were three – performance, composition and listening. These were along the lines promoted by Keith Swanwick when the original curriculum was devised although he talks about “audition” rather than “listening”. This is why so many music lessons divided each lesson into three so each attainment target was met. Many music teachers in the 1990’s would spend 30% of their lesson listening to music, 30% performing and 30% composing and leave 10% for tidying up. This was almost impossible considering time restraints in a music lesson and led to singing being marginalized as that was something that could be covered in whole school assemblies. This was one of the reasons why the National Curriculum was changed to two attainment targets – “performing and composing” and “listening and appraising”. This makes sense because, as we have seen, performance and composition are interlinked in many ways and it is a greyer area than many people think. Finally music ended up with one attainment target “music” and this is the one that is currently used. The general idea is that performing, composing and listening happen in lessons but are not split up into their components. The fundamental problem is that it assumes that performance, composition and listening are all the same level of difficulty. They are not. Another is an assumption made that these elements should all be delivered together every lesson. This is a mistake. To understand this we need to think about Bloom’s taxonomy and its ranking system. Bloom’s is not gospel and there are many things in the model that we can disagree with. However, as a general principle it is fair to say that “creating” is a more complex intellectual skill than “remembering”. Some educators say that in a good lesson we should start each lesson at the bottom of the pyramid and end with the top. In music’s case, that would mean we should start with listening, go to performing and then end with composition. Unfortunately, this is a complete misunderstanding of the taxonomy. The whole point is that each level builds on the foundations of the levels before. So to get good creative work, what we should be doing is building very strong prior foundations. This takes time and requires a solid knowledge base. In music lessons, this would suggest that we should be focused more with listening, aural and performance skills in the younger years and creation should be the priority in the senior years. I am not advocating that there should be no composition in the youngest years, but there should be less of it than later on when children have more musical experience. This stands to reason – a good chef has good knowledge of recipes but understands that a certain ingredient will make something new and delicious. Without that knowledge it is a matter of trial and error to discover a new recipe. Sometimes by luck this could happen but most of the time it would be a culinary disaster. The same goes for music – if we build the creation of music on the firm foundations of aural, listening and performing work with a good theoretical knowledge then we have more chance of it being successful. What I believe should be happening in music education is a gradual transition. The youngest children should be doing a predominately aural and performance based curriculum whereas the oldest should be predominately creating music. However, this is not the case as many children struggle with composition, not because they haven’t been doing it, but because they are building on sand as not enough listening, aural, performance and theoretical skills have been emphasized when they were younger. This is not because teachers have concentrated on composition but because composition takes so much time to set up – getting the instruments ready, allocating groups, setting parameters before any composition work has actually begun. And composition requires thought and there is so little time to actually think in a fifty minute class where you have to produce some sort of quality end product. Finally, all lessons are zero-sum games as they are based in time – if you work on composition, something else has to give and normally that will be to the detriment of aural and performing work. Sadly, many children come out of their musical education at the age of fourteen and can barely play an instrument, have little to no musical literacy skills, know next to nothing about musical history and when asked say “we just played the keyboards” or “messed around in groups”. This is not because music teachers are terrible, it is because the curriculum has been inadequately organized and composition overtly or unconsciously emphasized. There is also a lack of joined-up thinking as secondary colleagues can sometimes know nothing about the musical accomplishments of the children they are inheriting. I have worked in schools where the secondary music teacher says “we start from scratch as they haven’t learned anything in primary”. There is also a lack of awareness of educational psychology and how children learn, especially when concerned with cognitive load theory and its implications. Fourteen should be the age when the majority of composition starts. By this age, all children should have good aural skills, can sing in tune with a repertoire of hundreds of songs, can play at least a dozen pieces of music to a good standard on an instrument, can understand standard Western notation and basic harmony and have some insight into some of the best music that has been composed and played around the world. And then with good instruction, as composition still needs to be taught well, children will have a better chance of creating music they can be proud of. In my old job I used to work for a music service travelling around a number of schools delivering primary music curriculum lessons. About two years into my employment we were told a large sum of money was coming into the service to be used for whole class instrumental tuition. Our music service had curriculum and instrumental teachers, so we created projects that involved us team teaching brass, strings, recorder, guitar, percussion and keyboard lessons. I was involved in the brass, strings and recorder and made some books and resources to go along with them. Much of the time we were having to make up everything because hardly any resources had been made for Wider Opportunities at the time and also we were trying to fuse together the curriculum and instrumental teaching. This sounds like it would be easy but it wasn’t as there were basically two completely different teaching philosophies that had to work together. The instrumental teachers were used to directly instructing an individual, pair or small group of children into performing and possibly improvising music. The curriculum teachers were more used to compositional work and singing in the classroom with large groups. Nonetheless, it was a really inspired move by the leadership team to pair us together and we learned an awful lot from each other. This was one of the best professional development decisions by a leadership team that I have experienced. The instrumental teachers learned about behaviour management of 30 novices at once which many had never done before and the curriculum teachers learned about the importance of high standards and technique. Amongst many other things. Like most new initiatives they were mixed. Much depended on the schools, parents and teachers and there was little that the music service could do if they did not liaise well. At its best it was probably the best thing that has been introduced into primary music ever. At its worst it was an experience of boredom for some students who had absolutely no interest in music whatsoever. We gave opportunities and experiences such as playing in big concert halls to hundreds of people and many of those students will remember those performances for the rest of their lives. The biggest difficulty was that children really could not hear themselves play as there were often 30 children playing simultaneously in a small hall or even a classroom. And it was almost impossible to give good feedback to individuals when everyone is playing together. When we got the children to play in groups or in rows it was a bit easier. What could make the projects more successful? In our service the progression was poor. The idea was that when the project finished, the children who were interested would move into small instrumental groups. This did happen and some were successful but there was quite a large drop out rate. One feeling I had that never went away was thinking that we were just giving a taster for children on playing an instrument and the worry was that we were reinforcing the idea that you do a bit of music and then you quit. This is particularly bad because one of the most powerful arguments for music on the curriculum is that you have to practice and stick at it to succeed. And most children did quit because the tuition for Wider Opportunities was free but in most cases, parents had to pay for small group tuition. Some schools did offer free tuition but they were the exceptions not the norm. 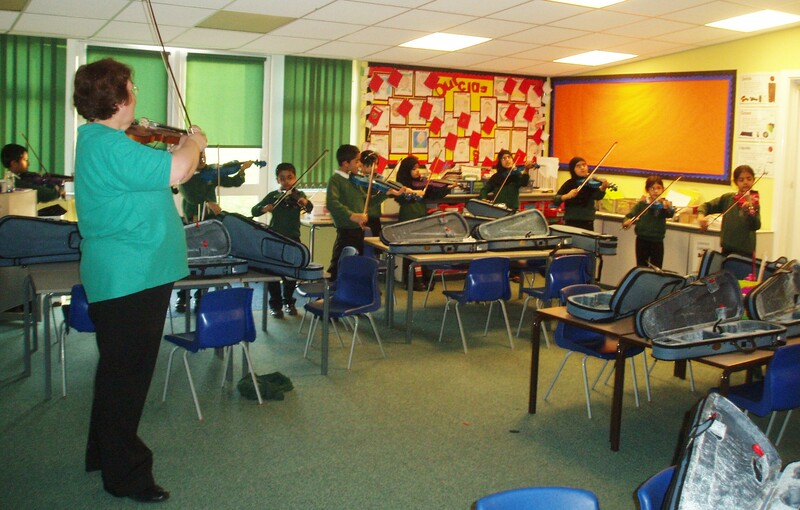 I also think we needed a clearer aim – some of the curriculum staff thought we were supposed to be teaching the curriculum and the instruments were just a resource to be used, whereas others thought the object was to teach them to play an instrument to a beginner’s standard just like the traditional group model. Some thought it should just be a taster or an opportunity for children to trial the idea of playing an instrument. There were some teachers who were completely against the project and did not participate. I talked to one of these teachers and the reason they had for dismissing the project out of hand was simply because they could not see a clear aim to the project and they thought this would undermine the instrumental work that was currently being done successfully. Having left the service for a number of years now, I think I can say retrospectively that when I was there the aim was not well communicated but by having a concert at the end of the project with repertoire on a CD, we knew what standard we were expected to get the children to. I think a more standardised repertoire would have been a very good idea but like I was saying at the beginning, we were setting up the projects from scratch so there was a large element of trial and error. All successful music approaches should continue and anything that is stopping children from experiencing good quality music education should be rethought. That’s the whole point of this blog. In a change from the plan, I am choosing the horn as the instrument of the week for the week after half term. As a tribute to the Back to the Future that celebrates its 30th anniversary this year I thought we would have some film music. It also features a timpani that we did mention in passing a few weeks ago. This was another relatively long instrument of the week video but it worked well. It introduces the guitar as well. It’s a great example of tempo as the music is slow, fast, gets faster and gets slower at times. It also has some double bass harmonics which was an opportunity to say that the double bass was going to pretend to be a violin. The children loved that bit and was amazed that such a low instrument could also make a high sound. We then talked briefly about the instruments in the string family. You will need about 7 minutes at the beginning of the lesson if you wish to use this. 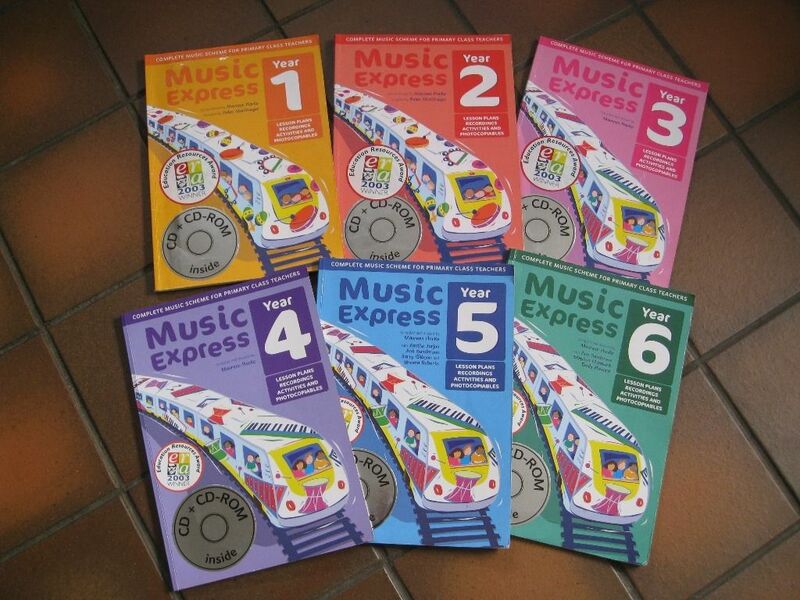 These books are in my opinion one of the main reasons why music education in primary schools is generally poor. I bet if you are a British primary music teacher you may have seen one and more likely have seen them in your school. I am not going to demonise them completely, there are some really good bits and some that I use in my own teaching. The “Hey Mr. Noah” in Book 3 is a good resource, really good fun and helps to teach different rhythms. Many of the songs are good, using time tested material in the A & C Black repertoire which Music Express is part of. But the reason the series was made was so that primary teachers with no knowledge of music could teach the National Curriculum for Music at Key Stages 1 and 2 with no need to learn anything about musical notation and very little requirement to play musical instruments. I can understand that for pragmatic reasons there was a need for this as the provision of instruments in British schools is pretty dire. But counter-productively it let headteachers off the hook. Why would they need to put any money into music when you can deliver the curriculum with these six books? The consequence is that children can get through the first 6 years of their musical education without need to learn a single melody on an instrument. And that is what happened and why we are in such a mess now. I am normally an advocate for good quality textbooks in primary schools so I do feel a bit of a hypocrite to write off the one textbook series that is well used in a primary school. Textbook use in British schools is some of the lowest in the developed world. In my opinion, the success of “Music Express” is due to the low expectations of music on both the teachers and the children. They have been successful because they promote a dumbed-down curriculum. I have looked through a whole host of other textbooks and they are all pretty poor. LCP seems rushed and poorly crafted. I still see Silver Burdett resources in music classrooms and they have been updated and bought by Pearson but I don’t have experience of the new incarnation. The best primary music text-book series I have found is an American book called “Gameplan” which delivers an Orff curriculum from Grades K-6. The reason that it is better is because the standards expected are higher. However, you really need to be a qualified Orff teacher to deliver it and have your room set up a bit like my friend’s. So what is the answer? The catch-all is to say “more training” for staff and I sort of agree but the problem is not how much, or even the quality of the training but the content in the training. Sadly, there is a widespread pedagogy amongst music teachers that results in a two-tier music education. There is the traditional route for the elite (read people who can afford instrumental lessons for their children) and a progressive route for the rest (read people who cannot afford instrumental lessons for their children). Because of this, most of the music training offered is progressive and does very little to actually teach young children music but to entertain them. I think the answer is to actually change the curriculum itself to something more rigorous. I will delve into this in a later post but for now will leave you with an alternative curriculum that does do this – the curriculum used in Alberta, Canada. Instrument of the Week 4 was the xylophone. I wanted to play the children a high quality video of a xylophone by Evelyn Glennie but I could not find any that were of a good enough quality so I decided to show them the following video of three percussionists playing music from the computer game “Legend of Zelda” on a marimba. This was a good idea as it also has a few other instruments from the percussion family. One of the best bits is where it features a glockenspiel and I was able to explain the difference between a glockenspiel and a xylophone. There is an awful amount of learning and musical terms in this video. The tempo changes, the texture changes, there is an ostinato on the glockenspiel. There are a mixture of tuned and untuned percussion instruments such as timpani, a snare drum, a marimba and a glockenspiel. I also told them to look out for the triangle which only appears at the very end. It is over 4 minutes long but the children listened enraptured without any talking or fidgeting. Afterwards, I introduced the children to the percussionist Evelyn Glennie and used the words “deaf” and “blind” that 90 percent of the Y1 and 2 children had never heard of (90% are EAL). I introduced “blind”, as at a later date I am going to introduce the children to my favourite musician Stevie Wonder. I think it is important for children to learn about living expert performers and composers. The most confusing part of the IOTW was that the instrument was the xylophone but the video was of a marimba. I did explain the differences between these instruments briefly but thought the children would remember the word xylophone a lot more clearly as it is one of the only words that young children learn that begins with an “x”. I normally spend only about 4 minutes in total on IOTW but this one was a bit longer. In total, I spent about 7 minutes on this starter.